Help Documents - Version 5 Group Registration SetupWhat is Group Registration? Group Registration allows 2 or more people to register as a group under one group code. The ability to capture "extra," or "guest" names and addresses on a person's registration page. Names so captured WILL NOT have their own registration record and will be invisible to registrant-centric actions such as emailing all registrants, making a name badge, sending a post-event survey and obtaining a report with the "extra" names included on their own row. What are the 2 modes of group registration? 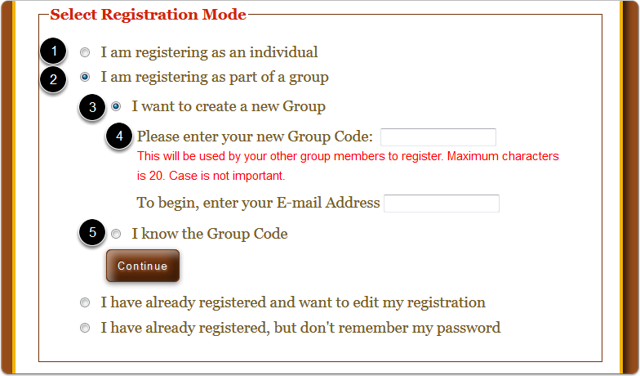 Group Code Registration - The Group Leader enters himself/herself and then distributes the group code to their group members whereby they will register themselves independently - How do I turn on Group Registration WITH Group Codes? Simple Group Registration - The Group Leader enters himself/herself and then enters their group members without using a group code - How do I turn on Group Registration WITHOUT Group Codes? An event can only operate in one mode. Once the event is published and registrants are accumulating, the mode cannot be changed - therefore, test thoroughly BEFORE you publish. Zoom: What are the 2 modes of group registration? Having a banquet? Think of a group as a table and the group leader is the table captain and the group members are seats at the table. Your event can accept individual, group or both individual and group registrations simultaneously (Your registrant chooses how they want to register). How does the registrant select how they want to register? Next: Where do I access group registration?